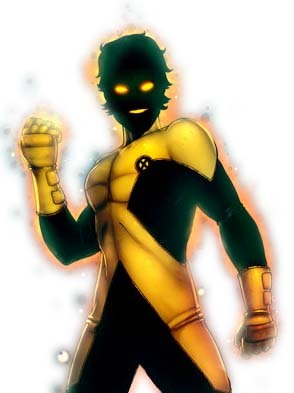 First Appearance: Marvel Graphic Novel #4 (1982): "The New Mutants"
Sunspot, a native of Brazil, is generally regarded as black. But it is worth noting that his father is black, but his mother is white. Excalibur Annual #2 (Oct. 1994): "A Change of Worlds"
Marvel Fanfare (vol. 1) #27 (July 1986): "McLeod's Mutants"
Marvel Fanfare (vol. 1) #45 (Aug. 1989): "New Mutants"
Marvel Team-Up Annual #6 (Oct. 1983): "The Hunters and the Hunted!" New Mutants (vol. 3) #1 (July 2009): "Return of the Legion, Part 1: We Were Many, Once"
New Mutants (vol. 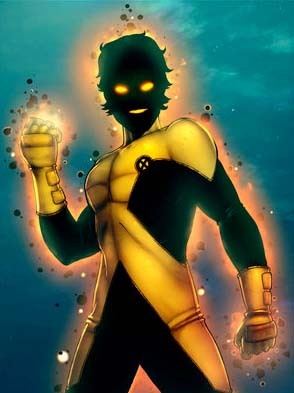 3) #2 (Aug. 2009): "Return of the Legion: Part 2"
New Mutants (vol. 3) #3 (Sep. 2009): "Return of the Legion 3: Cognitive Therapy"
New Mutants (vol. 3) #4 (Oct. 2009): "Return of the Legion: Part 4"
New Mutants (vol. 3) #5 (Nov. 2009): "Debrief"
New Mutants (vol. 3) #6 (Dec. 2009): "Necrosha: Part 1"
X-Force (vol. 1) #75 (Mar. 1998): "X-Force Pin-Up"
X-Force (vol. 1) #81 (Sep. 1998): "Hot Lava"
X-Force and Cable Annual '95 (Dec. 1995): "Fun, Fun, Fun!" X-Force Annual (vol. 1) #2 (Sep. 1993): "Extreme Measures"
X-Men: Legacy (vol. 1) #211 (July 2008): "Sins of the Father, Part 1"
Young X-Men #4 (Sep. 2008): "Extinction Agenda"
Young X-Men #5 (Oct. 2008): "Fall of the Mutants"
Young X-Men #6 (Nov. 2008): "San Francisco"
Young X-Men #7 (Dec. 2008): "The Other"
Young X-Men #8 (Jan. 2009): "The Y-Men, Part 1: Outnumbered"
Young X-Men #9 (Feb. 2009): "The Y-Men, Conclusion: Ascendant"
Young X-Men #10 (Mar. 2009): "Who the Hell is Cipher?" Young X-Men #11 (Apr. 2009): "End of Days, Part One: Ashes to Ashes"
Young X-Men #12 (May 2009): "End of Days, Part Two: Dust to Damned"